The high-kicking Happy Hoofers--Tina, Janice, Pat, Mary Louise, and Gini--have been booked to flaunt their fabulous flamenco footwork on a luxury train ride through northern Spain. But when a blowhard talk show host is found deader than four-day-old flan--with Gini as suspect numero uno--the feisty friends waste no time stepping into their sleuthing shoes to protect one of their own. The Happy Hoofers are back and this time Gini, the photojournalist and documentary filmmaker of the troup is the focus of the story. Green Spain is full of historic buildings and beautiful scenery. Recipes featuring shell fish and sea food from the region blend with the beautiful scenery and play a part in the poisoning of a nasty broadcaster on this tour. 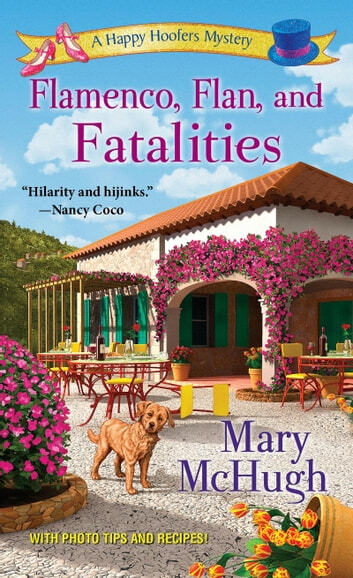 A cozy mystery. **I received a free digital copy of this book from NetGalley in return for an honest review. ** I am not sure how I felt about this book to be totally honest. Mostly luke warm feelings on the whole. I picked up the first one from the series so I will wait to pass complete judgment until I am finished that. Quick mystery read. Delicious looking recipes.